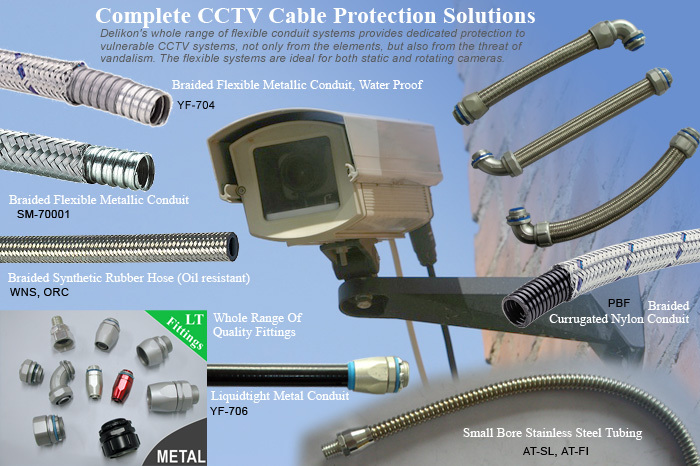 DELIKON's whole range of flexible conduit systems provides dedicated protection to vulnerable CCTV systems, not only from the elements, but also from the threat of vandalism. The wide range of DELIKON metallic and non-metallic flexible conduit systems is specifically designed to provide ingress protection to the vulnerable umbilical cabling used on CCTV cameras and networks. The flexible systems are ideal for both static and rotating cameras. Liquidtight conduit is available for systems that are affected by weather, such as torrential rain, which could damage the wiring and equipment. Small bore flexible stainless steel conduit, an extra-flexible product, available in the smaller diameters, is designed for tight-spot installation and where continuous flexing is required of a stainless steel wound hose. Delikon braided flexible conduit with metallic overbraid is a popular choice for vulnerable systems, offering. protection for electrical, coaxial, data and telecommunications cabling. Braided flexible conduits also provide the benefit of EMI screening and protection from vandalism. Dlikon braided flexible rubber conduit with metallic overbraid is a best choice for industrial systems, as it has all the oil & chemical resistance benefits associated with the rubber conduit, without the weight and restrictions of metallic conduit. Moving and rotating cameras require unrestricted flexibility, Delikon has a full range of both straight and angle swivel connectors. A whole range of quality fittings is specifically designed to maintain system integrity including fixed and swivel fittings.